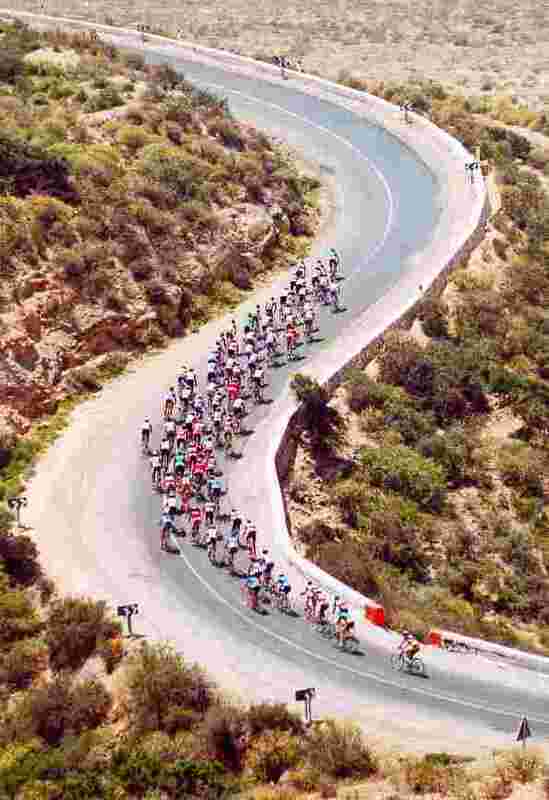 Maneuvering in the peloton is like a current in a river. Talweg is a term which describes the most navigable channel in a river – generally the place where the current moves the quickest. If you stand on a bridge above a river, the talweg is easy to spot though it isn’t necessarily straight down the middle where you’d expect it. Each racing field also has a talweg. Common wisdom is to use the outside to continually move and reposition toward the front where braking is less likely and crashing usually more avoidable, and where one can see and act upon swift racing action. It’s true moving on the outside often gives one a path of escape if the peloton suddenly dominoes in front of you; but the outside also requires more effort because of less aerodynamic protection. The same openness which provides a way up also has to be forced through with less draft, and domestiques sit on the outside of team leaders taking the wind for this reason. Miners bring forth gems by following a river’s origin and so can racers in the peloton. Watch to see where the flow is in the field, the talweg. Sometimes it’s outside and sometimes it’s a crooked path from line to line well inside. In either case, move subtly as sudden line changes don’t win friends. In race situations, an etiquette which respects safety is rewarded at times by a rider who remembers how you moved around them. Poise on the bike is a great advantage in these tight jostling scenarios. Size can be an advantage either way – larger riders moving others aside to get through and smaller riders coming underneath to pick a path to the front. Watchfulness is key to moving in that flow, so jump in with both feet taking care where the least amount of splash derives the way to best positioning. We are grateful for the wonderful tension between group speed and constant motion in the pack. We confess we blunder like tugboats rather than skilled kayakers at times. We ask for pack savvy and safety as we master this skill. Ponder Do I move in the group with stealth and grace? Affirm I can move my bike like flowing water or surging floods, whichever is appropriate and safe. Watch for points of entry and exit in the flow. 48The Message, Copyright © 1993, 1994, 1995, 1996, 2000, 2001, 2002 by Eugene H. Peterson.